Pollution can now be turned into art thanks to proprietary scientific processes developed at the MIT Media Labs. For over a century, mankind has depended on burning fossil fuels for energy. Although effective, fossil fuels are toxic, leading to around 20,000 premature deaths in America each year. Research also has shown air pollution causes 300,000 asthma attacks and 2 million lost workdays annually. What if pollution could be turned into something more useful, such as art? That’s what scientists at Graviky Labs have achieved with their line of paints known as AIR-INK – comprised of exhaust from cars. AIR-INK is created with a three-step process. 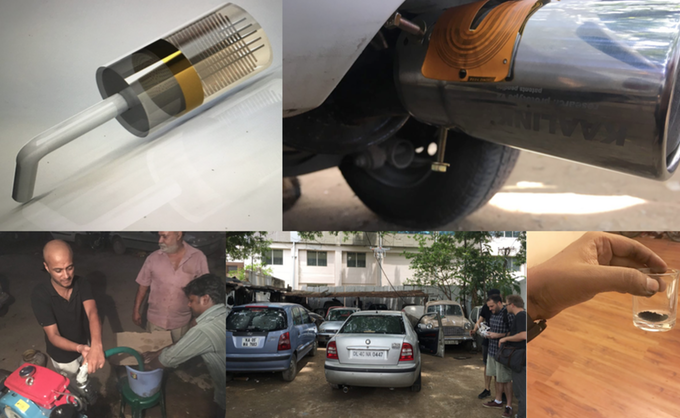 Emissions are first captured using a proprietary device known as a KAALINK (a play on the Hindi word for black), which is retrofitted to the exhaust pipe of vehicles and generators to capture outgoing pollutants. It’s designed to capture 95 percent of the pollutants emitted from a tailpipe. The KAALINK works by using a positive electrostatic charge on particles using an exhaust pipe. The pollutants are then drawn to a negatively charged chamber which uses a bypass system to allow air and water vapor to pass through. When the chamber fills after a couple of weeks of driving, a red light alerts the drivers the canister is filled. From there, Graviky transfers the soot into containers called carbon banks. The captured substances then go through proprietary processes to remove heavy metals and carcinogens, turning it into the final product. The entire system is engineered to eliminate back pressure so there’s no impact on engine performance. According to the company Kickstarter campaign, consumers can negate 45 minutes of car pollution by using 30ml of AIR-INK. 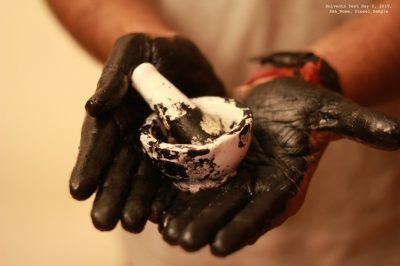 Despite being made of soot, the company says AIR-INK is non-toxic and as safe as any other commercial ink in the US market. It has been tested with users over the age of six years. In general, it takes 45 minutes of vehicle emissions to produce one fluid ounce of ink. There are several grades of AIR-INK including 2mm round tip, 15mm, 30mm, and 50mm chisel tip markers, along with screen printing ink. AIR-INK initially began as an experiment at the MIT Media Lab where researchers wanted to develop a handheld printer that ran off candle soot. After demoing the prototype at conferences, the team found artists and environmentalists were fond of the idea. This led to the development of the current product. Pricing for AIR-INK starts at $35 for a single 2mm marker. So far, the makers of AIR-INK have raised over $10,000 via their crowdfunding campaign, and the estimated delivery date is June 2017. Out of all of the pro-environment products or solutions out there, I truly thing this one is the best. I love the idea of solar power as a supplement, but this is taking that even a step further. This is great and I am sure it will not be cheap in the products that use ink, but having ZERO impact on the engine is a bonus. I like the idea a lot. It is nice to see another company taking on the pollution while all of the “others” remark that worrying about the environment is a waste of time. Good for the founders and BRAVO! I agree with you. After reading about this product, I have more faith in the fact that others are thinking about the environment in ways most do not.